There is a certain swagger and confidence that comes with Jackie Bradley Jr. It was an innate trait that was forged in his hometown of Prince George, Virginia, right outside of Richmond. Despite the swag, Bradley -- believe it or not -- was overlooked coming out of high school even with his considerable talent, talent good enough to keep him as a top prospect in the Red Sox organization for more than four years now. A spectacular August leading through September -- he's hit .320 with seven homers, 33 RBIs and posted a 1.063 OPS in that span -- has made him an incumbent favorite for a starting outfield spot for next year's team. Before his lofty status -- and temporary fall from that perch -- Bradley wasn't even considered good enough to play for hometown school, University of Virginia. He saw that as a snub. His best opportunity came from South Carolina, which he helped mold into a SEC powerhouse for a period. The Gamecocks won back-to-back titles with Bradley on the roster. From there, the 25-year-old has raked his way to the top. Bradley grew up playing against top-flight talent. He recollects his days with the Richmond Braves, an elite travel team based out of Richmond, Virginia. His team competed in the nation's best tournaments: Perfect Game's annual World Wood Bat tournaments in East Cobb, Georgia and Jupiter, Florida. Jupiter was the biggest of the two. "I wasn't even on the starting team then. I was kind of seeing everything and getting the experience. I played against Jemile Weeks when he was a senior in high school. That was when he was already committed to play at Miami," Bradley said in a phone conversation. "I remember Jason Heyward being in the tournament down there at the same time I was (at East Cobb)." I reminded Bradley of the time my team played him in high school. The moments that he and I recall was on a hot summer day in Georgia. Bradley, 16 at the time, was no more than 5-7 and 155 pounds soaking wet. Still, his presence was huge. He made some of our better pitching look like child's play. He smacked doubles into the gaps, offered fake-bunt slashes that caused our third baseman to crash -- only to get a ball screaming by his teeth moments later -- bunted for a hit and, of course, ran everything down in the outfield. His defense is -- and always was -- elite. People often misconstrue what they think to be superb athleticism and plus-speed for impeccable reads and jumps, precise angles and knowing hitters' tendencies. In short, he has an extremely high baseball IQ. Bradley glides to the ball like a ballerina while maintaining controlled aggression. It was -- and still is -- theatrical watching him play defense. He signed his letter of intent to attend South Carolina after his junior year in fall 2007. "I honestly wasn't thinking of the MLB when I was that age. I was just thinking of college at that moment," he said. "Everyone talked about going to the MLB one day, but my main focus was going to college"
Though he might beg to differ, Bradley was underrated coming out of high school. According to Perfect Game, he didn't even crack the top 200 players in the country. But his swagger wasn't held down for long. He knew he was meant for a big stage, even if it meant going to school a few hours down the road. 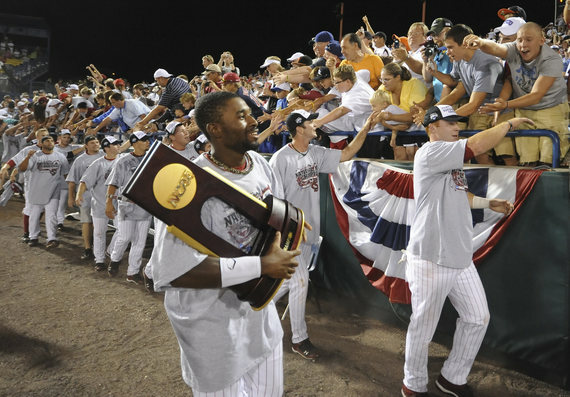 During his 2010 campaign, he won College World Series MVP, finishing his season batting .368 with 13 homers and 60 RBIs. "Sophomore year we made it all the way to the end. We actually lost our first game in the College World Series. But we were able to come all the way through the losers bracket and win it all," he said. "That was the school's first major championship out of the three sports (football, basketball, baseball)." After Bradley's junior year, the Red Sox took him in the first round supplemental -- 40th overall -- of the 2011 MLB Draft. It was a huge leap as it relates to how scouts projected him four years prior. But Bradley quickly plays down that word or idea of projecting one's talent. "At that age, no one can really project what you are going to be years down the line," he said. "They think they can project, and I guess that's all it really is. But you can't tell the future. You never know what someone is going to do, or how they are going to pan out." However, once Bradley entered the Red Sox system, the conversation quickly shifted from projection to expectation. He was supposed to be the fixture in centerfield for years to come. And with that in the back of the Red Sox's mind, Bradley moved through the system rapidly. "I only played 10 games the first year I signed. The following season I played half the season in High-A and half the season in Double-A. That was my first full year," he said. "And in 2013 was when I came for my first big-league spring training, somehow, I made the team." Somehow might be a bit modest on his part. In 62 spring training at-bats, he racked up 26 hits, two homers, 12 RBIs and a whopping 1.120 OPS. He struggled in his first taste of the bigs, though, and only registered three hits in his first 12 games. He was optioned to Triple-A less than a month into the season. 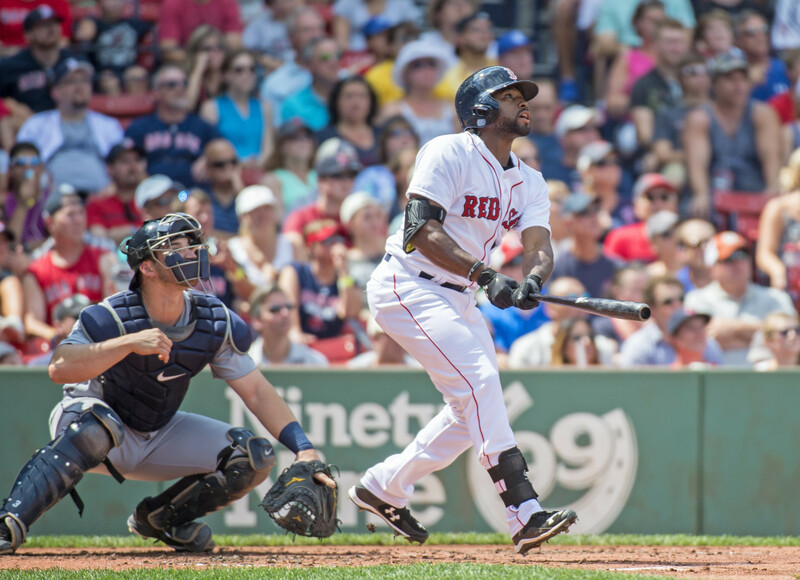 For the rest of his 2013 campaign, Bradley became somewhat of a tweener in the Red Sox system. He bounced from Triple-A to the majors, unable to consistently maintain a groove with one team. Many outside started to question the situation. 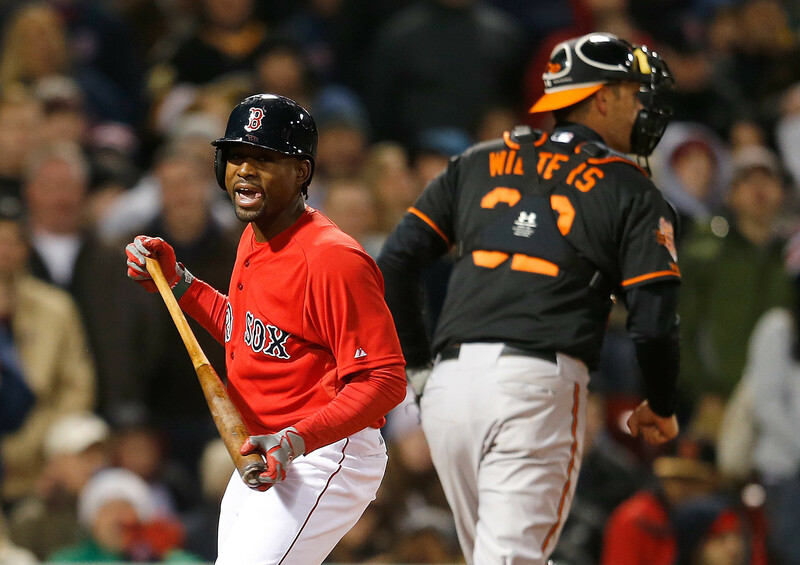 Did the Red Sox rush Bradley up too soon? Can he hit? The Sox won the World Series that year with Jacoby Ellsbury patrolling center and the newly acquired Shane Victorino in right. Bradley, on the other hand, was now the outlier. The following year wasn't that much different. At times, he looked lost at the plate -- and even overmatched. "Things weren't going my way. I started off pretty decent but things just kind of went down hill," he said. "I thought I was doing everything right." During and after the season, Bradley was written off by a lot of the media and fans. Expectations dwindled. But that didn't deter him, he says. He remained confident despite the doubts. "I never lost faith in what I believed I was capable of doing on the ball field," he said. "That is something I really pride myself in. As long as you work and put the effort in, things will be rewarded to you." Bradley's faith, once again, was put to the test coming into spring training this year. Mookie Betts, another highly touted Red Sox outfield prospect, created a buzz around the organization. Betts, just like Bradley two years prior, was now the promising young star. "As crazy as it sounds, it never got under my skin that the media was putting Mookie out there as the 'next best guy.' What people don't realize is that Mookie is my boy. He was my first roommate when we first got drafted," Bradley said. "I was always happy for him." Though hard to believe, Bradley stands by those sentiments. He truly trusts the process -- his process, even if the result means failure, and someone younger than him taking his position. Bradley trudged back to Triple-A, while Betts was named the team's starting center fielder for opening day. Bradley was recalled on three separate occasions, though. The last time coming after Betts crashed into the centerfield wall in July against the White Sox and was placed on the seven-day disabled list. The former college standout saw this as possibly his last chance to impress the Red Sox or find himself in another uniform. He hasn't looked back since. In August, he hit .354 with five homers and a 1.163 OPS. Bradley set the club record for most extra-base hits in a game after a 5-for-6 performance August 15 in a 22-10 win over the Mariners. He hit two home runs and three doubles in the game while racking up seven RBIs. With Hanley Ramirez struggling in left field this season and thus shifting to first base, Bradley is in a good spot to lock down the centerfield job for next season if he maintains his production. 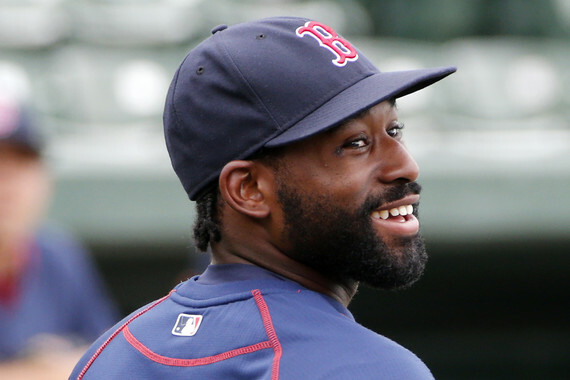 Between he and Betts, Bradley is the better center fielder. Betts will most likely move to left. "Nothing really has changed for me," Bradley said. "I really have no secrets. I just continue put in the work. It's something we do every day, constantly making adjustments, trying to play for that day." But to say Bradley doesn't play for the moments, too, would be misleading. He enjoys retelling the story of him throwing out Astros outfielder, George Springer, on a fly in the Cape Cod Collegiate League in 2009. "George would be able to tell you about that," he says with a chuckle. "He hit it so hard that I just turned around and started running toward the fence. Pretty much, when someone hits the wall in the air, it is a guaranteed double. And George is not a slow runner, by any means." Bradley makes sure to put emphasis on "by any means," painting a vivid picture of what was about to occur. "I just happened to get back there in time, pick it up and let it fly," he said. "He starts rounding first and booking it to second, and the shortstop was just waiting on him. After that, he just kind of goes into a slow trot like 'What is going on? What's this trickery?' He just slowed down and let the shortstop tag him. He then looked out to right field, and I looked at him and shrugged." Bradley loves to talk about his arm. It's his most prized attribute, and for a valid reason. In high school, he was clocked as high as 101 miles per hour throwing from the outfield. I jokingly asked why players continue to test his arm. "Good question," he said with a laugh. "I just make sure I keep it warm just in case. You never know when you got to use it." The quote, however lighthearted, is metaphorical for Bradley's career to this point: stay ready and warm, wait for that call. He didn't know when his next chance would be, but he made sure, each time, he was prepared. The questions have not gone away just because Bradley has posted solid numbers up to this point. Baseball is a game where talent is proven by large sample sizes, and Bradley doesn't quite have the portfolio to guarantee a major-league paycheck next season. Moreover, he has hit a little bit of a dry spell since our initial conversation. But that doesn't bother him. "I have absolutely nothing to say to that. I don't feel like I have to say anything or even give any attention to that," he said. "At this point I just will continue to keep playing hard, let the game dictate itself, not force anything and just keep riding this wave." Bradley is on his own island, and finally -- for now -- the currents are at ease.